Matrix metalloproteinases (MMPs) are a family of zinc-dependent endopeptidases. The main functions of these metalloproteinases are the degradation of the stromal connective tissue and basement membrane components. Recent data from model systems suggest that MMPs are involved in breast cancer (BC) initiation, invasion, and metastasis. Particularly, MMP-11 (stromelysin-3) is expressed in stromal fibroblasts adjacent to epithelial tumor cells, and high levels of this metalloproteinase were associated with tumor progression and poor prognosis of BC. Consequently, MMP-11 involved in these processes can be a candidate as a new potential prognostic biomarker in BC. 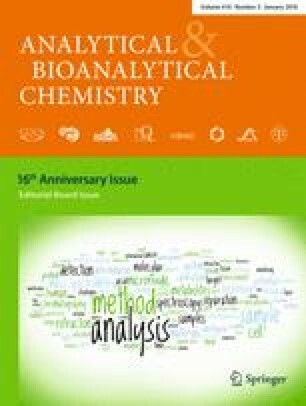 Bioimaging techniques based on laser ablation/desorption and mass spectrometry are rapidly growing in biology and medicine for studies of biological systems to provide information of biomolecules (such as proteins, metabolites, and lipids) and metals with lateral resolution at the micrometer scale. In this study, matrix-assisted laser desorption/ionization mass spectrometry imaging (MALDI-MSI) has been used for the first time to investigate the distribution of MMP-11 in human breast cancer tissues in order to show a possible correlation between cancerous and healthy samples, by differential proteomics and using such differences for possible cancer diagnosis and/or prognosis. Additionally, those human breast tissue samples were analyzed in parallel by laser ablation inductively coupled plasma mass spectrometry (LA-ICP-MS) in order to gather additional information about the elemental distribution of Zn and its possible associations with MMPs. Published in the topical collection celebrating ABCs 16th Anniversary. This work was supported by projects FC-15-GRUPIN14-092 (Principado de Asturias) and MINECO-13-CTQ2013-49032-C2-1-R (Ministerio de Educación y Ciencia). Parts of this study were supported by the Cells in Motion Cluster of Excellence (CiM-EXC 1003), Münster, Germany (project FF-2013-17). The study was performed with approval of the Ethics Committee of Regional Clinical Research of the Principado de Asturias in accordance with the ethical standards. Written informed consents were obtained from all patients according to the institutional regulations of the Biobank of Principado de Asturias. Mulware SJ. Comparative trace elemental analysis in cancerous and noncancerous human tissues using PIXE. J. Biophysics 2013;2013:8. doi: 10.1155/2013/192026.